While the detail and attention paid to the battle scenes is graphic, it is also incredible to see and is very realistic. A conscientious objector is defined as someone who, for reasons of conscience, objects to serving in the armed forces. Back in the 1940's, Desmond Doss was labelled as such even though he actually enlisted in the military. His refusal to even hold a gun, let alone shoot one, earned him the designation and a court martial hearing. However, it was determined he could serve his country and never hold a gun. Luckily for the guys in his unit this was the case as he saved a number of their lives. His story is chronicled in 2016's Hacksaw Ridge, coming out this week on Blu-ray, DVD and Digital Download. Doss (Andrew Garfield; The Amazing Spider-man) was a seventh day Adventist who personally didn't believe in guns and refused to hold one. However, he believed in the war effort and didn't feel right staying home while others were sent to fight. He wanted to go to war and help as a medic so he enlisted. During basic training though, his convictions almost got him court-martialed. Once in Japan, Doss' unit was assigned to take Hacksaw Ridge, a bloody plateau that the Japanese kept a strong grip on and sent many American soldiers to the hospital or their deaths. After their first battle and retreat, Doss stayed behind all night and lowered injured soldiers down to the bottom of the ridge to be sewn up by MASH doctors. Without him, an additional 75 men would have been killed and, despite almost getting killed himself, he kept on bringing guys down. With his help, the Americans eventually took Hacksaw Ridge which helped them move forward to Okinawa. In the end, Doss was the first conscientious objector to receive the Medal of Honor for actions above and beyond the call of duty. With a strong cast, Hacksaw Ridge tells a complicated and moving story. Garfield is perfectly cast as the mild-mannered, quiet Doss whose physical appearance is even somewhat similar to the real-life hero. Sam Worthington (Avatar) and Vince Vaughan (Wedding Crashers) do a good job as Doss's Captain and Sergeant, respectively, who do their best to get Doss to quit but, ultimately, end up being very glad he didn't. Teresa Palmer (Warm Bodies) is Dorothy, Doss's love interest, and Hugo Weaving (The Matrix) plays Doss's alcoholic father who struggles with his own demons of PTSD (before anybody knew what that was). Both are terrific and bring out the best in Garfield. Directed by Mel Gibson (The Passion of the Christ), the film has a distinctive feel that is definitely Gibson's calling card. Besides being extremely graphic and gory, there is an unexplainable underlying tension that keeps the audience engrossed throughout. While depicting the war with accuracy, Gibson also brings the human element into every scene, making one feel a multitude of emotions. Say what you will about his personal life (and I would have plenty to say), he is a prolific director with a keen eye and will undoubtedly be remembered for his filmmaking abilities. The Blu-ray is presented in 1080p high definition video with a 2.39:1 aspect ratio and this is one film you will want to watch in the highest quality you can. While the detail and attention paid to the battle scenes is graphic, it is also incredible to see and is very realistic (or so I'm guessing since I've never actually gone to war). Coupled with the Dolby Atmos TrueHD 7.1 audio, the film quality is excellent. Each bomb and gunshot can be felt, making the experience a full one. 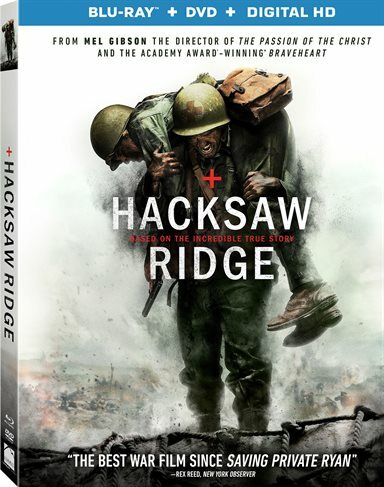 The Extras include a few deleted scenes, the theatrical trailer, a Veterans Day greeting from Gibson and an hour-long feature called The Soul of War: Making Hacksaw Ridge which discusses everything from script to cast to effects and the real life Doss. War films are always a little difficult to watch but Gibson is careful to balance the atrocities of war with the heartwarming tale of one man's faith and conviction, making Hacksaw Ridge an entertaining, realistic, and complicated film to view. Definitely worth the viewing, however. Download Hacksaw Ridge from the iTunes Store in Digial HD. For more information about Hacksaw Ridge visit the FlickDirect Movie Database.